As far as I’m concerned, that’s huge! CBS knows there were missteps. You can see that (as I mentioned yesterday) in the firings of show-runners Gretchen J. Berg and Aaron Harberts five episodes into season two…and the lighter, more comical tone that seems to have been injected into the series (almost reaching Orville levels with the turbolift “sneeze scene” at the end of the Discovery season two trailer). The writers, producers, and actors, and probably even the suits at CBS are also well aware that fandom is split in their reaction to Discovery. Some love it, and some loathe it so much that they actively campaign against it and argue vehemently with anyone who doesn’t share their rage. CBS wanted an unbridled hit for Trek fans and also for the general public. They know they didn’t get either. I also suspect CBS is aware, on some level, that they dropped the ball on celebrating and even acknowledging the 50th anniversary of Star Trek back in 2016. CBS was relying on the momentum of just saying Discovery was in production carrying them forward with fans. Ultimately, though, it was a missed opportunity. Robert Meyer Burnett (editor of Prelude to Axanar and director of Free Enterprise) told me a few years ago: “Star Trek needs a Kevin Feige.” Feige is the president of Marvel Studios. Anything that happens at Marvel happens because Kevin Feige says, “Make it so.” Feige’s decisions and strategies have led the studio to $16 billion in international box office revenue since 2007. Star Trek didn’t have that at CBS. Unlike at Paramount, where Executive Producer Rick Berman steered the franchise (after Gene Roddenberry’s death) through TNG, DS9, Voyager, and Enterprise; CBS just let Star Trek drift aimlessly through space. Discovery co-creator Bryan Fuller might well have become the “Kevin Feige of Star Trek,” but he was fired while the new series was still early in production. But earlier this summer, STAR TREK FINALLY GOT ITS KEVIN FEIGE!! In his interview, Stapf seemed to imply that CBS is now trusting Kurzman with the keys to the warp drive: “It’s more Secret Hideout and the rest of the Trek brain trust coming to us and saying, ‘we think this would be really cool, storywise, characterwise. '” Throughout the interview, Stapf and EVP Original Content Julie McNamara were repeatedly saying Alex this and Alex that when talking about plans for the direction of Star Trek. I’ll be honest: I was initially somewhat hesitant to get too excited over Kurtzman. Sure, his production company had just gotten a $25 million deal to develop five or six new Trek shows. But that could all be just so much hype. Remember when CBS announced Nicholas Meyer’s deal to develop a new Trek show about Khan? “I’ll believe it when I see it,” I thought. Also, I wasn’t keen putting too much trust into someone who produced both Star Trek (2009) and Star Trek Into Darkness…two movies that, at least in my opinion, got Star Trek completely wrong. But the fact remains that Kurtzman is, at heart, a Trekker (and I really blame J.J. Abrams anyway). 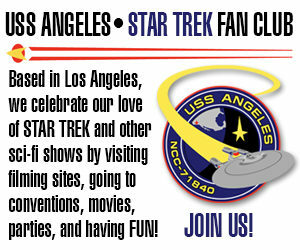 And I would much rather have a FAN being the Trek Czar than some clueless CBS executive. Wouldn’t you? Then I heard about the four “Short Treks” that are being planned leading up to season two of Discovery. These will be self-contained 10-15 minute mini-episodes focusing on Saru, Tilly, and even Harry Mudd. One of these shorts will even be written by Pulitzer Prize winning author Michael Chabon. “Hmmm,” thought I, “that actually is pretty exciting!” It’s different and original. (In a way, these shorts are almost like fan films.) And it’s perfectly suited for the All Access “format”—since All Access doesn’t require any format. Content doesn’t need to be a certain length at all. So if you’re gonna force us fans to pay to watch Star Trek (and yeah, they are), then at least use the streaming platform innovatively. I’m told that no one at the Las Vegas convention was expecting to see Patrick Stewart. He wasn’t even an announced guest! This kind of “theatrical” surprise announcement by Kurtzman was reminiscent (to me, at least) of the way Steve Jobs used to present the newest Apple products. Was this “OMG moment” Kurtzman’s idea? It certainly wasn’t anything like the style that the CBS executives had been employing these past few years. If it was Kurtzman’s idea, then sign me up for his fan club! But it didn’t stop there. As I learned more about this new Picard project, I discovered that it was all the brain child of writer Kirsten Beyer. If you don’t know who that is, remember the Discovery episode”Si Vis Pacem, Para Bellum” where Saru, Burnham, and Tyler go down to that forest planet and Saru kinda freaks out? Many fans (even ones who don’t like Discovery) have said they thought it was the most Star Trek-ish episode of the series thus far. Beyer is also the lead author of Pocket Books’ Voyager novel series, having written nearly a dozen of them, and functions as the coordinator for Discovery tie-in media, such as comic books and novels. In other words, she’s not just a writer (and a good one); she’s a real fan. And this fan suggested an idea that she is now getting the chance to develop and flesh out. What a dream come true! And one of the people she’s been fleshing it out with is the aforementioned Michael Chabon, also a major Trek fan and a damn good writer. So, it this the turning point for Star Trek? Is Kurtzman the Trek Czar we’ve been waiting for to finally give this franchise some direction again without letting the suits at CBS run roughshod all over him? But one thing is certain, CBS is now taking Star Trek much more seriously than they ever have before. Yeah, things could still go horribly wrong. The older Picard could end up being like King Lear, weak and senile, as he enters his twilight years. 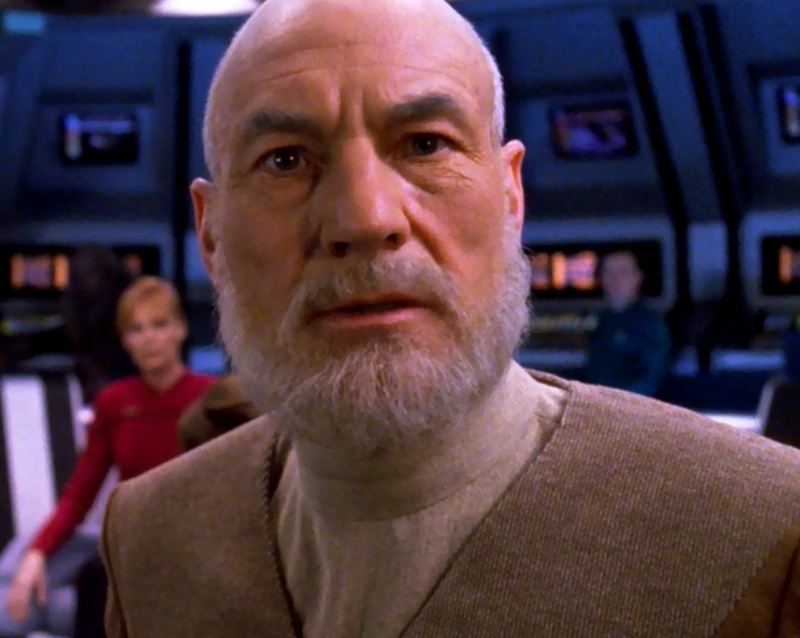 Maybe a Shakespearean actor like Sir Patrick would appreciate the opportunity to explore that unseen aspect of the character, but will it make fans cringe to see a fading echo of the once vibrant Jean-Luc Picard descending into tragedy and madness? But I’m not going to predict or expect the worst. Instead, I’m choosing to look at this all with optimism. I remember just ten short years ago: when Star Trek: Enterprise had been cancelled prematurely, and Star Trek‘s prospects of returning to television seemed as remote as the Andromeda Galaxy. Now look where we are! I’ve never been one to accept the argument that “no Star Trek is better than bad Star Trek.” No Star Trek means it’s dead, Jim. For over a decade, we had no new Star Trek on any television set. Now we not only have one series, but we’ll soon be getting a second, plus the Short Treks, and possibly even more beyond that. If we’ve gotta pay for Star Trek, then better to get a LOT of Star Trek to make that six bucks a month worth it! Star Trek has lived long…nearly 52 years. Most TV shows fade away after that much time. But despite some stumbles and missteps, Star Trek is most assuredly prospering right now. To me, as a fan, there’s really good news. A thought has occured to me since this is a rare if not unique event I thought I would share it. I wonder how much influence The Orville has had on the Networks? There they were with a brand new Star Trek a rather large budget and to be polite about it they didn’t do very well. Along comes the multi talented Seth MacFarlane and blows it out of the water getting much more viewers on a much smaller budget. At least I think I have my facts correct I am sure JL will correct me if I am wrong. Could it be they looked at The Orville and thought so that’s what we have been doing wrong? I am sure Mr MacFarlane as a fan will be delighted at this turn of events and it will inspire him to do even better with the Orville. I’m not sure of the Orville’s budget, but it was probably less than Discovery’s. That said, about 60% of the Discovery budget was covered by Netflix’s licensing fee to CBS to carry Star Trek. Fox didn’t have that advantage. As for viewership, their pilots did about the same, but Orville had a significant and fast drop-off. However, those numbers stabilized, and in the coveted 18-49 demographic, Orville was actually doing really well. As for Discovery, we don’t know those numbers specifically, but at most it’s 2.5 million (since that’s the total number of subscribers to All Access) and likely quite a bit less…my source tells me more like a half million at best. In comparison, Orville is drawing in 3 to 4 million viewers per episode. However, because CBS gets $6/month per viewer, even if we only count the six months that Discovery was on and assume they then canceled, that’s $36 x 500,000 or $18,000,000. That’s comparable to the advertising revenue you might see from 12 episodes of a decently-rated prime-time network show. And remember that CBS is still in “investment” mode as they build up All Access. They expect to take a loss at first. All this is to say that CBS isn’t looking at the Orville with jealousy or envy. But they are looking at its success strategically. The reactions from viewers toward Orville have been almost universally positive (except from critics). For Discovery, it was the opposite. The critics loved it, but fans were divided passionately. In that, CBS is probably wondering how they can get a stronger, more loyal fan base. It’s not that they think they did something “wrong” so much as trying to figure out (in their mind) what they could do that would be more right. Well as regarding the DISCO Klingons apparently while this Picard bomb was dropped they announced that Kenneth Mitchell will return for Disco Season 2, unknown is it if he will return as Kol, but I think he will. But also that The Klingons will get another make over….some speculating that they will go somewhat to the original TOS Klingons (and make it that these were a sub species like the Aenar to the Andorians ) or they will go towards the TMP to the TNG Style Klingons or something in between. who knows but have to say Season 2 of Disco is looking a lot more Trek then the previous season. I hadn’t heard that rumor. Where is it from, Steven? Dude, EVERYONE needs a Kevin Feige. KEVIN FEIGES FOR ALL! HUZZAH! As for the new project, it brings to mind the Babylon 5 telemovie “Legend of the rangers”. This show had an “episode title” TO LIVE AND DIE IN STARLIGHT. Yep, this was gonna be a series. Alas, it was not to be. Nor was “Lost Tales”(Although it was AWESOME AS HELL to finally see what the Babylon 5 station, jump gates, and other nerdy chewy centers would have looked like with GOOD CGI). One advantage of the Babylon 5 franchise is that it NEVER ran into franchise fatigue. True, but crossovers can get grating. One of the reasons I walked away from Enterprise is because they KEPT THROWING IN CONNECTIONS TO NEXT GEN(The Borg were barely justifiable, but the Ferengi just made me mad). Look, as long as we don’t have Captain Riker engaging the holodeck because “I have a problem that only Burnham can solve because reasons” I’m good. I’ll remain cautious. I’ve only liked 3 of the TV shows Kurtzman’s done (Herc, Xena, Sleepy Hollow) and the rest never captured me, even How-are-ya-Five-Oh. And there have been MANY others that never interested me. So, ratio-wise, he doesn’t do many TV shows I’m interested in. and of course, this show. So how much time can he spend on this? We’ll have to wait and see, but I’m not going to get my CBS subscription just yet . . . .
Invisible Man, Dracula, Frankenstein, Hunchback, Phantom, Van Helsing, that sounds to me like these guys were the contenders for the “dark universe franchise” they wanted to kickstart with the remake of the mummy, which failed spectacularly and put the entire concept on hold, so I’m thinking these projects won’t stand in the way of anything, they’ll either fizzle out quietly or stay frozen until far into the future. No, it just means it’s “mostly dead,” aka, ‘slightly alive,’ so you can’t go through its clothes looking for loose change just yet. I have seen a lot of TV shows and movies made by fans of the genra end up being steaming piles of crap. So I all I am going to say is that they better not frak this up! They need to stick with how ships look, how aliens look, how tech looks even the warp effect with this Picard project. The need to stick with established canon, no crazy FTL travel, no funky bridge windows being a view screen. Stick with canon, make it like TNG just 20 years later, and I swear if a Ferengi shows up looking like Morn mated with a Cardassian Vole, I will lose my mind. Lovely article, but I think you missed out one important driver of hope behind this, Sir Patrick himself! I don’t think he will let the studios ruin Star Trek. From what I can tell, Sir Patrick very much embodies Jean-Luc Picard, and so he will fight to make sure that Star Trek returns to the vision of Roddenberry as depicted in TNG. From what I have seen, Sir Patrick looks set to take a very active role in this, not just from the acting side, but from the content side as well, deep in discussions about the nature of the show. For me out of anyone when we talk about Star Trek existing in “good hands”, I find myself trusting Sir Patrick’s hands the most. Perhaps a tad off topic, perhaps not but I do agree that No Trek is better than Bad trek. Sure there is the possibility that the show may recover. I sincerely hope STD pulls off this miracle but that is what it will be, a miracle. My reasoning is quiet simple and not a case of “throwing the baby out with the bathwater”. If you air a continuous stream of Bad Trek and to define what I mean by Bad Trek it is something that bares little resemblance to the previous series but is also just a bad show, this drives away the existing fans. More importantly new viewers who decide to give this weird Sci Fi thingy a go look at it wonder what the hype was all about and depart never to be seen again. This devalues the franchise and puts the studio off creating new shows. Whereas with No Star trek fans want and demand more and in the fullness of time will hopefully get it. Parallels can be drawn to the new Doctor Who series many fans who have watched it since it aired over 50 years ago have simply quit fandom, more will be driven away once it it is aired, most are just now hoping for a swift cancellation; since it is obvious that the BBC won’t backtrack on its PC Diversity box ticking and recast the show. That doesn’t mean that they never want to see any more DW but are prepared to wait it out till the show is revived in its correct format and are prepared for the many years that it will take. Actually, the reboot of Doctor Who in 2005 drew very good ratings (both in the U.K. and the U.S.) and held them at between 7 and 8 million until Matt Smith left the show and beyond. Peter Capaldi’s first season (series 8) held t 7.3 million but dropped to 6 million in series 9. However, you can’t blame that on “PC Diversity box ticking) since Clara Oswald (a heterosexual white woman) was still his companion. When the black lesbian Bill Potts (played by Pearl Mackie) joined in series ten, the ratings dropped again, but only to 5.5 million. Honestly, I think the drop off was more due to audiences just not enjoying Capaldi’s more acerbic Doctor (the surliest since Colin Baker…not counting the War Doctor). After a string of very lively and positive doctors–Sylvester McCoy, Paul McGann, Christopher Eccleston, David Tennant, and Matt Smith (all of them happy and upbeat)–the grouchiness of Capaldi rubbed some viewers the wrong way. Personally, I loved Capaldi as the Doctor and felt that the two-parter that ended on Galifrey (“Heaven Sent” and “Hell Bent”) was one of the best stories yet. Capaldi’s performance in the first part, carrying the entire hour all on his own with no other actor to play off of, was masterful in my opinion! I’m optimistic that Sir Patrick wouldn’t sign on to do something that put Picard in a bad light. But you’re way more optimistic about Kurtzman than I am. If he was that big a Trekie (I find the term Treker stuck up and pretentious) the movies wouldn’t have been so bad and we wouldn’t have those fucked monstrosities they’re calling Klingons, at the very least.